Friends of the fiddler: Cheering in a scene of Fiddler on the Roof, GBS and GBN students rehearse for the spring musical in the dance room. Fiddler on the Roof tells the story of Tevye, a milkman, whose spirit, pride and faith helps him get through the oppressive czarist Russia. Fiddler on the Roof will be showing in the Auditorium from April 26-29. Tradition: whether it is holding onto old family rituals or formulating practices for new generations to come, each are common threads holding many families together. 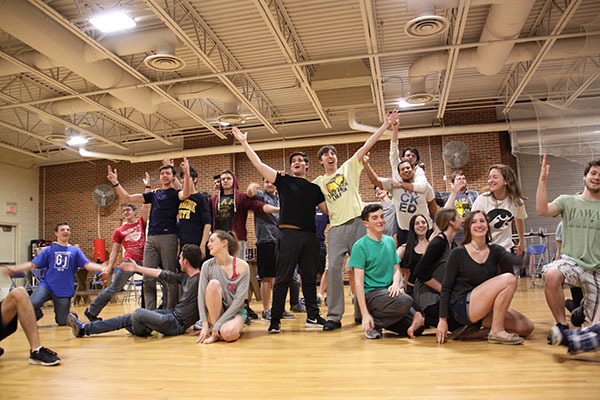 This struggle of holding onto the old, but seeking the new is one of the various underlying themes portrayed in this year’s Glenbrook Musical, Fiddler on the Roof, showing at South’s Norman E. Watson auditorium April 26- 29, according to senior Ethan Reiss. Senior Aidan Dempsey plays Lazar Wolf. He explained that this overarching theme of tradition and clinging to old beliefs is something that his character portrays throughout the course of the show. He added that the tradition of arranged marriage plays a crucial role in the plot, as the show takes place in pre-revolutionary Russia, specifically a small Orthodox Jewish community named Anatevka. In contrast to Lazar’s belief of maintaining traditions, such as arranged marriage, Reiss explained that his character, Perchik, stands for just the opposite. Reiss explained that he plays the husband of Tevia’s second daughter, Hodel, and in many ways is an outsider as he is not from Anatevka. Reiss added that Perchik works to counter some character’s, such as Lazar’s, more traditional views of society by standing up for new ideas and beliefs, some of which being related to socialism and communism. According to Reiss, he sees many similarities between himself and Perchik, which he believes has allowed him to better portray his character in the musical. Reiss explained that like Perchik, he has an interest in the history of communism and socialism. He also sees some parallels in Perchik’s frustration with his government during the pre revolutionary era, and some Americans’ frustration with our government today. Like Reiss, senior Jordan Zelvin has also connected with her character in the musical, Yenta. Yenta, the town’s matchmaker, plays a very maternal role in the town as she does not have children of her own. Zelvin added that she can also connect to Yenta and the roots of the musical at a deeper level through her Jewish faith, as much of the show is centered around the traditions and practices of Judaism. In addition, Zelvin explained how, as a cast, one of the most crucial first steps in the rehearsal process was to really understand both the culture and mindset of both Jews and Russians during the time period of the musical. According to Zelvin this understanding was translated to the cast in many different ways ranging from cultural lessons to even guest speakers. Senior Yael Sheinfeld plays Tevia’s wife, Golde. She added that this overarching presence of tradition is something that has contributed to her experience in Fiddler on the Roof largely as this is her fourth and final Glenbrook Musical. Sheinfeld explained that while each show put on every year is special, this year’s is especially unique to her. For Reiss, this too is his fourth and final Glenbrook Musical. While he explained that he is sad to let go of one of his personal yearly traditions at South, he is hopeful that in his final musical performance he is able to help convey to the audience the importance of acceptance and understanding that Fiddler on the Roof has to offer.